The SureCommand Fleet Management System (FMS) is designed to display operational information about your organization's fleet activities. The FMS system will enable you to manage all your vehicles by displaying a list of all your vehicles, the number of km usage per day, maintenance schedules, costs, fuel consumption, keeping a roster of users and much more. The SureCommand FMS dispatch system displays the daily kilometer usage, fuel consumption per vehicle, maintenance schedule, incident and user history. The SureCommand FMS is designed for the user to monitor the usage and condition of the vehicles more efficiently. Optimize your fleet management operation with SureCommand. Every vehicle will have a profile that will be unique to it. The vehicle profile is designed to organize vehicles activities, records, and requirements. The profile displays information like the maintenance log, user history, warranty information, maintenance history, daily mileage recorders, travel logs, and fuel consumption. As a safety measure, the SureCommnad FMS will require drivers to perform a pre-drive inspection that verifies whether the vehicle is roadworthy. The SureCommand FMS displays a list of all vehicles that are in operations with a status of their schedule and condition. The list of vehicles displays the information about the vehicles age, kilometers, next maintenance schedule and current user. 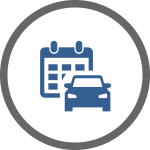 The information enables schedulers to identify available vehicles so they can quickly assign them to a driver and plan out the driver's route for the day. The SureCommand Fleet Scheduling System (FSS) organizes and arranges the operational schedule for the vehicle fleet. The SureCommand FSS system is designed to avoid double bookings, reduces maintenance schedule conflicts, records users and usage. The FSS system gives users a display with the operational overview dashboard, travel calculator, vehicle scheduling and a driver logbook on who had possession of the vehicle last and how many KM they had used while it was in their possession. 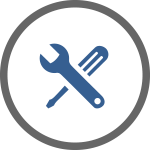 The FSS enables users to manage scheduled and unscheduled maintenance and repairs and will automatically restrict usage if an existing maintenance work order is outstanding. The FSS enables vehicle operators to submit a maintenance repair request with a description of the issues and its level of urgency. 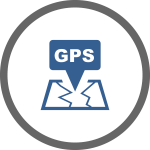 The SureCommand FMS also has a maintenance records section within the profile of the vehicle and allows for uploads of repair estimates and receipts. The SureCommand System can diagnose vehicle faults remotely and prevent downtime by connecting with the vehicle the OBD reader to transmit the information back to dispatchers. The SureCommand FMS includes a roadworthiness inspections form so the vehicle operator can inspect the vehicle and report their findings remotely to the dispatcher. 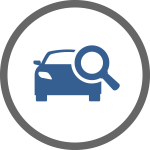 The inspection system is available through the SureCommand mobile application and includes the ability to upload pictures of the condition of the vehicle. 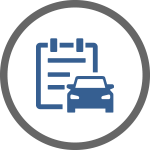 The FMS Inspection Report will allow your organization to keep meticulous records of the vehicle condition within the digital profile of the vehicle. 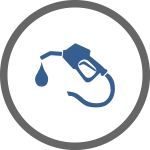 Monitoring fuel consumption is critical to any operation as fuel is one of the largest costs that a fleet operation can incur. The SureCommand FMS has features the enables the accounting and auditing of fuel consumption to measure fuel expenses and detect unusual fuel consumption activities. This system is designed to calculate the fuel consumption per KM and the average cost per vehicle. If an anomaly is detected, the SureCommand FMS will advise users of the irregularities. The SureCommand FMS Tracking system provides users with real-time monitoring of fleet activities to enhance safety and optimize vehicle resource management. The FMS provides safety alerts and reports that allow managers to address properly and train drivers on how to operate the vehicles more safely and decrease fuel costs. The SureCommand FMS alerts dispatchers and vehicle operators about the driving performance. The FMS guides vehicle operators to safely operate the vehicle by alerting them to correct poor habits in real-time. This feature enables management to identify aggressive driving behavior better, decrease idle times, improve routing and dispatching. The SureCommand FMS uses an OBD system to connect to the vehicle with a is a simple Plug & Play install that takes only minutes. Installs are tamper-proof and easy to manage and eliminate the need for hard-wiring and potential vehicle damage. 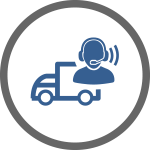 The SureCommand FMS Vehicle Tracking System gives dispatchers better control over the entire fleet, get to customers faster and respond quickly to emergencies.